You might have noticed I’m running a little poll on deviantart. I have to say I’m a little concerned at how many people voted for the joke option, probably most of them seriously. The books will start shipping out again as soon as I get them from the printer. Jordi in a motorcycle helmet looks so… off. But awesome! That jacket and helmet make Jordi look so badass / out of character. I hope that happens, then I can be a huge hipster and be like, "I knew this comic when it had a small and dedicated fanbase." It makes me wonder how many people were joking or how many were just that oblivious. You mean the "What's that?" option, right? Agh, this page had be giggling like an idiot. Cameos left and right. I can't handle this, man. I'm not familiar with motorcycles so I have to ask if there's enough room for three people on one? Considering that it has a sidecar, I'm sure it can work out. Whoops I didn't notice the sidecar. Thanks! He looks so bored when Jeremy told him what happened. Huh, he's riding on the left side of the road. what is cynthia, chopped liver? well, jeremy IS the one who got "tazed". i wanted a book before, but they went so fast! i think i'll preorder one. Then I went to the library and saw this was up. Officially the best day ever. 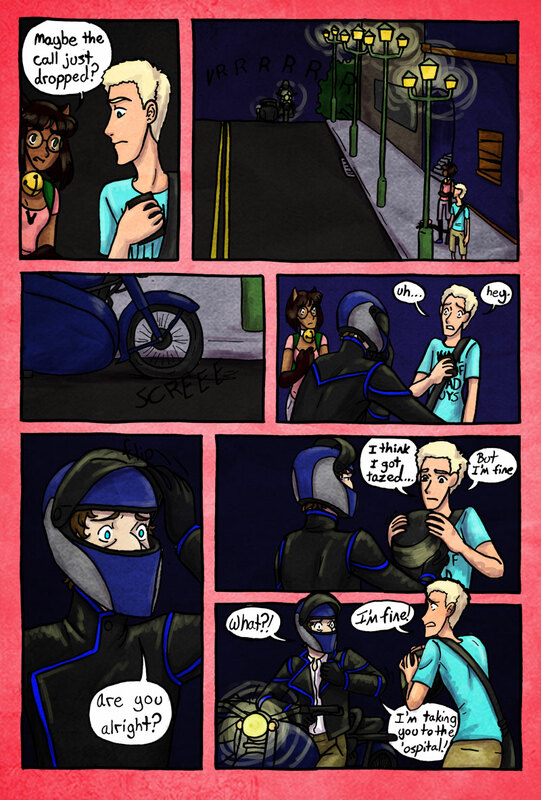 Jordi on a motorcycle…no wonder Jeremy said on the last page that he was going to just add sexual frustration on the list for his worst night ever! Men on motorcycles are UNF. Jordi in his riding leathers on a motorcycle is UNF x a million. I do love how "oh god!" Jordi's eyes look when he raises the visor, like he's trying to figure out how bad Jeremy needs help. Those two have it for each other so bad, and Jeremy is really, really blind not to see how concerned Jordi is for him. Jeremy needs to tell Jordi that he doesn't need to go to the hospital; he needs to be taken to bed. Poor Cynthia; I have a feeling she's either going to unintentionally cockblock, or she's going to be ignored in her repeated requests to call in the murder. …DAMN, Jordi, wear that jacket more often! Just so he can whip it right off ala last panel? that's easy for you to say. Omigosh…… Jordi looking all badass is just……… Badass. Why so adorable? Even with badass motorcycle and stuff, I want to give you a hug. Anyone else find it kind of weird seeing him without his mask tanlines? 2 things for Jordi. 1, that jacket is awesome, I wish I had one like it and 2, nice sidecar. My word that is a classy jacket. Unrelated, Cynthia, maybe you should just see if somewhere will let you use their phone, because it looks like these two will be distracted for a while. The motorcycle helmet reminds me of his spy mask, except a million times sexier. <3 Words cannot describe. How happy. This page makes me. OH MY LOARDS. DAT. MAN. Wait, so Jordi and Jeremy know each other, and Jeremy gets nervous around Jordi, and yet this is set BEFORE Cuanta Vida? Or is it a parallel universe? Haha, this whole time I've been thinking of it as a prequel. So does that go for Sin Pararse too? Sin Pararse exists on the same timeline as Worst Idea. I love how Jordi does not give him a choice, whereas Cynthia got shot down for suggesting it. …I know it seems bad to say this now, but I like jeremy's new hair color. It fits him much better. I mean, this IS Jordi were talking about. I assume he’s got a Cockney accent, since he omitted the “h”.